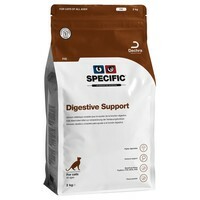 Specific Digestive Support FID Dry Food for Adult Cats is a nutritionally balanced diet for cats with digestive problems to ensure they get all the nutrients they need. Made with highly digestible ingredients that maximise nutrient absorption into your cat’s digestive system, the food also contains a high content of minerals and fat soluble vitamins to compensate for the reduced absorption during periods of digestive upset. Maize, Fish Meal, Maize Protein, Pork Fat, Egg Powder (including Dried Egg Products containing Natural Egg Immunoglobulins), Potato Protein, Rice, Minerals (including Zeolite), Animal Protein Hydrolysate, Vitamins and Trace Elements (including Chelated Trace Elements), Fish Oil, Methionine, Ammonium Chloride, Beet Pulp, Psyllium Husk, Yeast (Source of Β-1,3/1,6-Glucans and Mannan-Oligo-Saccharides), Taurine, Fructo-Oligo-Saccharides, Xylo-Oligo-Saccharides, Yucca Powder. My cat was diagnosed with food sensitivity seven months ago. Our Vet recommended Specific digestive support and we haven't looked back, her sickness and upset stomach have cleared up and she just loves this food. I adopted one year old cat from the Cats Protection. Sadly she hadn't been looked after properly by the previous owners and was suffering with IBS. The vet recommended this food and we haven't looked back. Her stools are now firm and she isn't as windy. My other cat eats it, too. They both love it. This product is excellent. My female cat Pippa is 10 years old and suffers from chronic pancreatitis. Since using this dry food as advised by my vet she has had less flare ups.